I just love the way this came out, the cool colors are very calming! It's been awhile since I did a card with digital anything on it. So glad that I found the time to play! Ohhhhh, this is so pretty! Love the soft colors and so girlie, love it! So very pretty. A lovely combination of challenges. 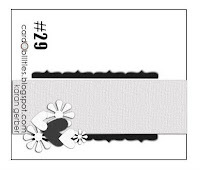 I like the stitched detail, the stamped border and pretty pearly swirl! Thanks for playing along with CR84FN this week! What a beautiful card!!! Love all the FABULOUS layers! Great take on the challenge colors! 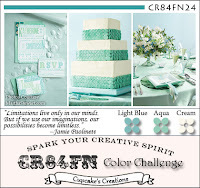 Thanks so much for playing along with CR84FN!